But 55 Cancri-e—now named “Janssen” (Thank you International Astronomical Union! )—is even more exotic with the recent discovery of an atmosphere. A February 7th research paper in the Astrophysical Journal, by a team of European astronomers, reports that Janssen has an atmosphere rich in hydrogen. This makes Janssen the first exo-planet, that we know of, to have an atmosphere. The team used the Wide Field Camera 3 (WDF3) on the Hubble Space Telescope, and a new scanning technique, to gain an understanding of Janssen’s atmosphere. Along with hydrogen, the team also found helium, and potentially, hydrogen cyanide. Given Janssen’s surface temperature of 2000 K (1727 C), and its proximity to its host star, the existence of an atmosphere is surprising. The team suspects that the hydrogen-rich atmosphere is left over from the planet’s formation 8 billion years ago, and is a remnant of the nebula that the planet and star formed from. Super-Earths are the most common type of planet in our galaxy, though none exist in our solar system. They are called super-Earths because they have more mass than Earth, but are smaller than the gas giants. A greater understanding of super-Earths should mean a greater understanding of the most common type of planet around. “This result gives a first insight into the atmosphere of a super-Earth. We now have clues as to what the planet is currently like, how it might have formed and evolved, and this has important implications for 55 Cancri e and other super-Earths,” said Professor Giovanna Tinetti of UCL. The existence of hydrogen cyanide in Janssen’s atmosphere is also significant. Its presence indicates a carbon-rich atmosphere. This supports the idea that Janssen is a diamond planet, though that conclusion is still far from certain. “If the presence of hydrogen cyanide and other molecules is confirmed in a few years time by the next generation of infrared telescopes, it would support the theory that this planet is indeed carbon rich and a very exotic place,” said Professor Jonathan Tennyson, UCL. The team has used their new technique on 2 other super-Earths, but no atmosphere was found. 55-Cancri e is about 40 light years from Earth. Its host star is slightly smaller, cooler, and a little dimmer than our Sun, and its year is shorter than an Earth day. Awesome per the real name! “Janssen”… I’ve waited my life for the day when I first heard the name of a planet outside our Solar System, and that day is today! 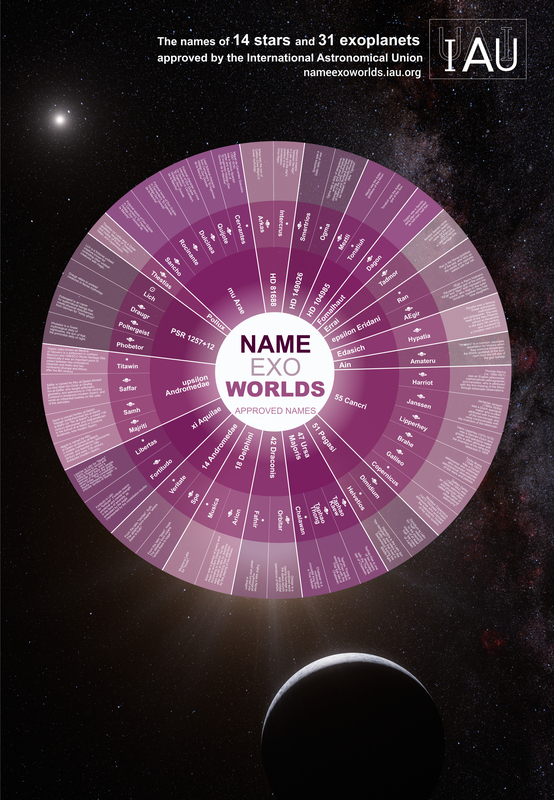 Do you know if any other exoplanets have official non serial number names? Yeah, this is really cool. Another indication that we live in the future. As for the names of exoplanets, there was a world-wide contest to name a bunch of them. On 15 December 2015, names for 31 exoplanets and 14 host stars, voted for by the public, were accepted and are officially sanctioned by the IAU. The winning names are to be used freely in parallel with the existing scientific nomenclature, with due credit to the clubs or organisations that proposed them. N.B. There’s one error in that graphic: it’s Zacharias, not Jacharias Janssen. Should say ‘super-earth’ not ‘exo-planet’. Come on EG, after your nonsensical claim that the LIGO gravitational wave came from Markarian 231 got called out I’d have thought you might start paying some more attention to detail. Did you wright for The Daily Galaxy previously? Oops: wright is wrong, should be write.